Capes are a superhero tradition, rooted deep in comic book history. Superman may have been one of the first to do it, but we think Batman did a much better job of pulling the look off in printed page! You'll rarely see the Dark Knight in a comic panel without wearing one (he IS called the Caped Crusader, after all). Of course, your kid probably doesn't care all that much about the fact that Batman has been rocking the cape since 1939. He mostly just cares about how cool he's going to look when he's dashing through the neighborhood dressed as his favorite superhero, fighting pretend bad guys from Gotham City. Don't worry, because we're here to tell you that he's going to look AMAZING wearing this Dawn of Justice Batman Cape. 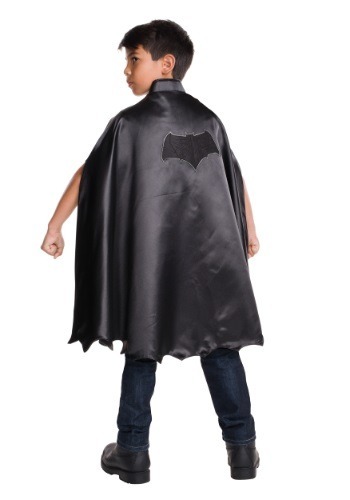 This deluxe child Batman cape looks like the one worn by Bat-fleck in the Batman v Superman movie by Zack Snyder. Complete with an awesome bat-symbol that's based on Frank Miller's take on the DC superhero, this accessory gives your child a heroic look that the bad guys won't soon forget, nor will you! When you pair this up with one of our licensed costumes, your kid might even feel tough enough to take on Superman with this signature look wrapped around him. Of course, you may want to find a huge supply of Kryptonite and have him engage in some serious cardio training before you send your young one off to battle against Supes for the fate of the Earth!